An efficient wastewater treatment with reduced carbon foot print is possible thanks to integrated anaerobic digestions solutions supporting recirculation of nutrients and energy saving. 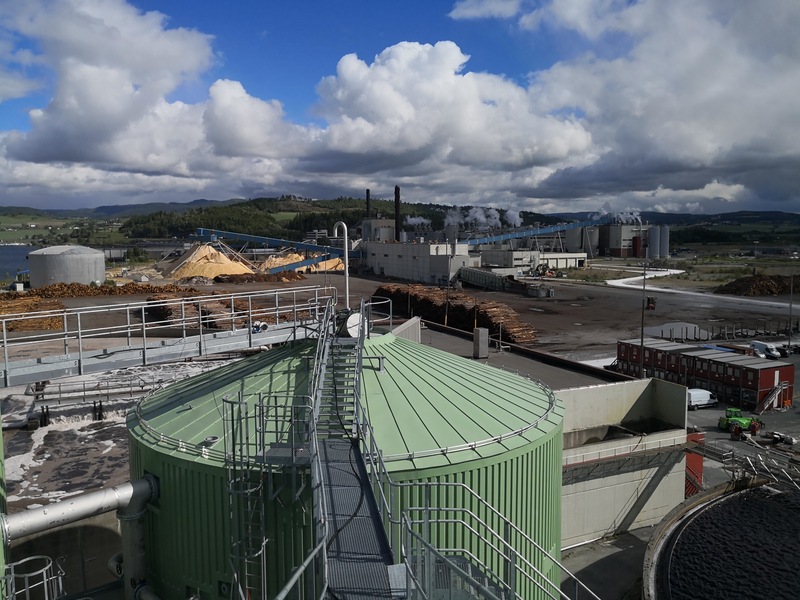 At the Norske Skog Skogn pulp and paper mill outside Trondheim, Norway, a new biogas plant, under construction since late 2016, it’s turning into operation during the summer. The facility, processing wastewater from the mill and organic waste from fish farms located along the Norwegian coastline, has a capacity of 125 GWh per year corresponding to about 12,5 million litres of diesel. The biogas plant, own by Biokraft an affiliated company of Scandinavian Biogas, offers the opportunities for modifying conventional operation at the existing wastewater treatment plant processing effluent from the mill, lowering its carbon footprint. 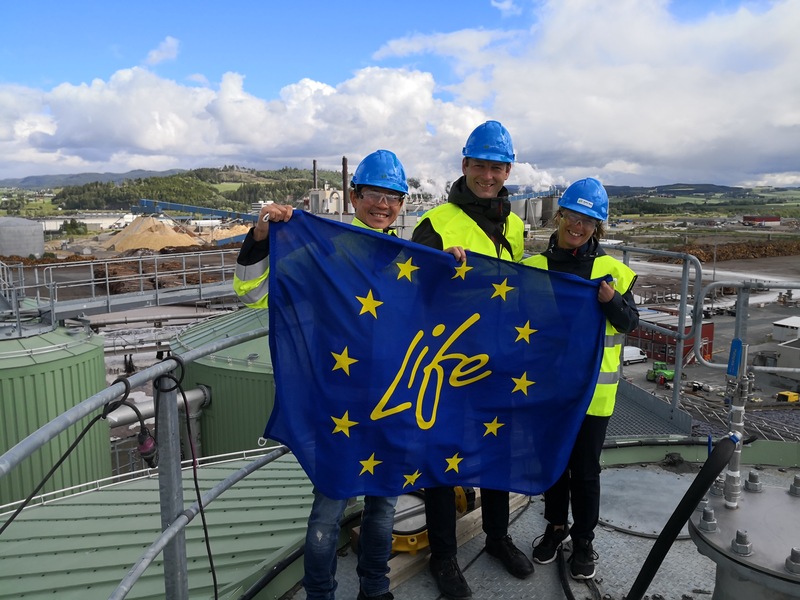 This is, in essence, the scope of the demonstration project EffiSludge for LIFE, supported by the European LIFE Programme for Climate Change Mitigation, under implementation at Skogn. 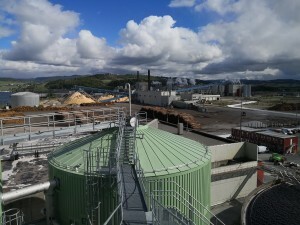 “The Skogn project is innovative and will work as a positive example of a win-win concept within industrial symbiosis where a pulp and paper mill and a biogas plant, in this case, can benefit from each other’s products” says Prof Jörgen Ejlertsson, Head of Research and Development at Scandinavian Biogas. The base of the wastewater treatment at Skogn is today a conventional active sludge process where organic contaminates are biologically degraded by excessive aeration. The air increases the oxygen level in the water and thus makes the degradation of the organic material to carbon dioxide possible. The process also requires nutrients such as nitrogen and phosphorus needed to support microbial growth. In parallel to the degradation, an increase in the microbial biomass occurs and biosludge (activated sludge) is formed. The excess biosludge is regarded as a waste, wet and hard to dewater and thus often incinerated with loss of energy. To minimize the amount of sludge produced, an extensive aeration is often applied, thus degrading not only the organic matter in the wastewater but also a large part of the formed biosludge. This set-up fulfils its purpose but at the same time means that huge quantities of electricity is consumed in the aeration step and that the retention time in the wastewater treatment needs to be long (high sludge age). EffiSludge for LIFE considers the sludge as a resource for biogas production. This makes a shift from minimizing to maximizing sludge production, thus reducing both the need for aeration and the retention time in the wastewater treatment (low sludge age). Translated to energy consumption this means a reduction with about 40-50% for the sole aerobic basin. Furthermore, thanks to the anaerobic co-digestion of sludge with other organic waste enriched in nutrients, the recirculation of post digestion reject water into the wastewater treatment plant will provide most of the required nitrogen and phosphorus by the microflora, reducing external dosing of chemicals (urea and phosphoric acid). In the Skogn case, this set up is expected to replace all of the nitrogen and about half of the phosphorous that is today dosed in the aeration basin. Thanks to energy and chemical saving, as well as of a more suitable disposal of the biosludge which is turned into biogas fuel, the overall carbon footprint of the wastewater treatment plant will be reduced. 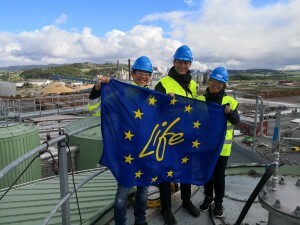 “The demo-project EffiSludge for LIFE will decrease the yearly CO2 emissions at the Skogn’s mill by ca. 3500 ton” says Dr. Francesco Ometto, Project manager for EffiSludge for LIFE – “Applied across Europe, where there are today over 900 mills processing more then 40 million tonnes of pulp each year, the EffiSludge concept could contribute to a carbon saving of a few hundreds of thousand tonnes”. The EffiSludge project has a high potential towards increasing the resource efficiency and reducing carbon footprints of industrial wastewater treatment and this is only possible thanks to the anaerobic digestion process now in place. After the start-up of the plant, the performance of the EffiSludge concept will be evaluated for over one year. It will represent a positive example of a resource-efficient wastewater treatment to be applied within the pulp and paper industry as well as in other industries with similar set-ups. On this topic, the project is organizing a workshop this November, as part of the Inter Baltic Biogas Arena (IBBA) workshop series. The two days workshop will be held in Norrköping, Sweden, and it will offer the opportunity to visit the Fiskeby Board mill where the local wastewater treatment is integrated with biogas production. For further information visit EffiSludge website and watch the animated explanatory videos. This project has been co-financed under EU Life program.